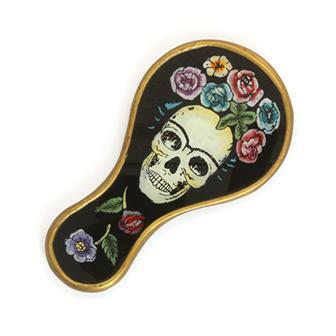 Reflect upon life with our beautiful Fair Trade mirrors! Perfect for placing anywhere in the home, these lovely looking glasses add a wonderful personal touch. Made from small pieces of coloured glass arranged in an eye catchingly bright pattern, these rainbow mosaic mirrors are handmade in Bali. 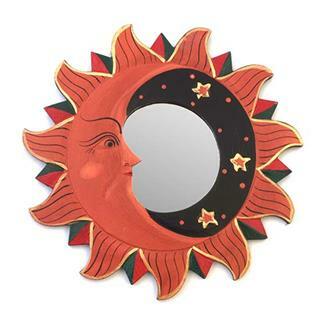 These beautiful hand carved mirrors depict the sun and moon with splendid gold detailing. Each mirror has a metal hoop on the reverse for ease of hanging. 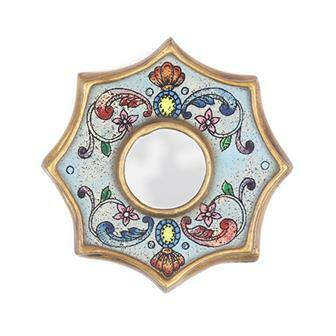 These beautiful, small sized hand carved mirrors depict the sun and moon with splendid gold detailing. Each mirror has a metal hoop on the reverse for ease of hanging. Beautifully hand crafted mirror made with a wooden base which is then hand painted and framed with glass for a gloss finish with a small piece of mirror. 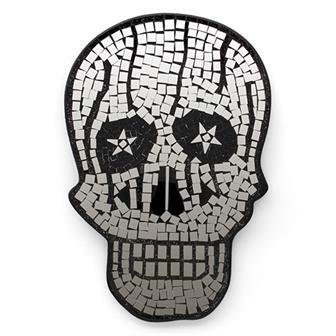 A large carved skull complete with black mosaic tile and glitter background. These hand made, ethically traded, mirrors are inspired by Mexican sugar skulls produced for "Dia de Muertos". 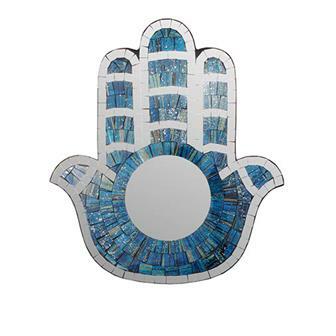 Beautifully handmade Hand of Fatima design mirrors. 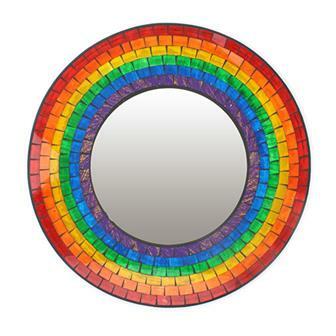 Carefully constructed using small pieces of coloured glass and a large central mirror, each mosaic has a metal ring on the reverse for ease of hanging. 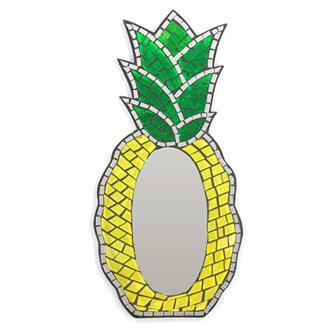 Vividly colourful and brilliantly bright, these pineapple mirrors are great for adding a little tropical flavour to any room. Carefully constructed using small pieces of coloured glass and a large central mirror, each mosaic has a metal ring on the reverse for ease of hanging. 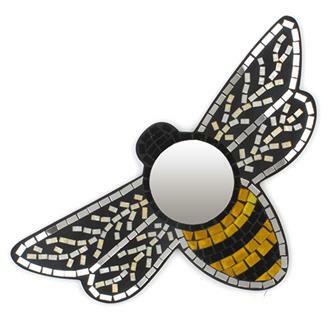 Made from small pieces of coloured glass arranged in a busy bee design, these brilliant mosaic mirrors are handmade in Bali. This mirror has been carved into a detailed owl shape before being carefully decorated in a mosaic style with mirror segments and coloured squares. This mirror comes with a metal loop for ease of hanging anywhere in your home. 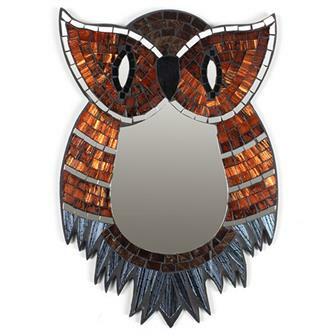 This beautiful mirror has been carved into an owl shape before being carefully decorated in a stunning mosaic style with mirror segments and coloured glass squares. This mirror has a metal loop on the reverse for easy hanging anywhere in your home. 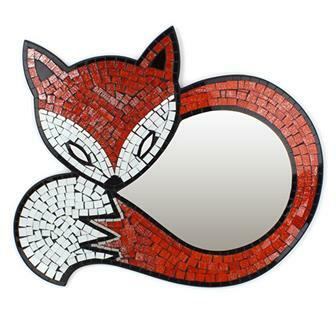 These wonderful curled fox mirrors have been handmade using small pieces of coloured glass to create a beautiful mosaic, perfect for displaying on any wall. 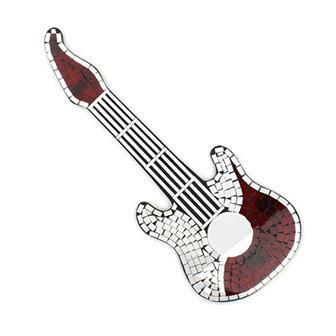 This smaller version of our extremely popular guitar mosaic mirror is sure to impress, easier to ship and better suited to those with limited space. 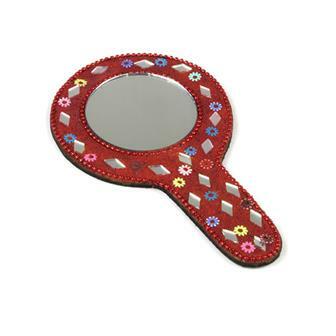 Bright and bold little hand held mirror adorned with glitter mirror work and beads. Approx: 8cm × 14cm Colours and patterns vary. 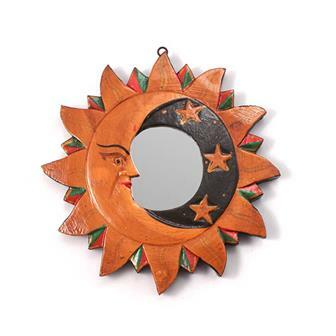 These wonderful vanity mirrors are carefully hand painted in Madhyapur Thimi, just outside Kathmandu, Nepal. Each piece is made from thick card and is decorated in the traditional brightly coloured painting style from Mithila region. Read more about these fascinating pieces and their creators here. 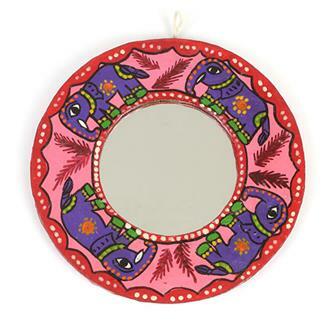 These wonderful round mirrors are carefully hand painted in Madhyapur Thimi, just outside Kathmandu, Nepal. Each piece is made from thick card and is decorated in the traditional brightly coloured painting style from Mithila region. Read more about these fascinating pieces and their creators here. 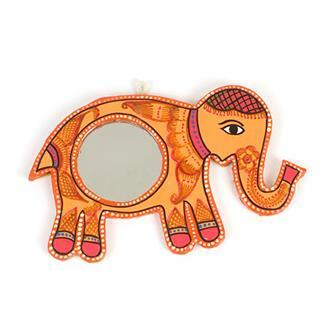 These wonderful elephant shaped mirrors are carefully hand painted in Madhyapur Thimi, just outside Kathmandu, Nepal. Each piece is made from thick card and is decorated in the traditional brightly coloured painting style from Mithila region. Read more about these fascinating pieces and their creators here. 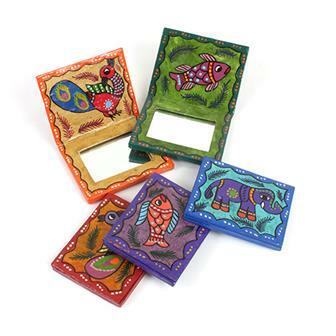 These beautifully decorated hand vanity mirrors are hand produced by a small family workshop in Peru. Each one features a pair of 'Calaveras,' Day of the Dead style skulls.